The early improvement and selection of white clover was the basis for establishing successful pasture throughout New Zealand. 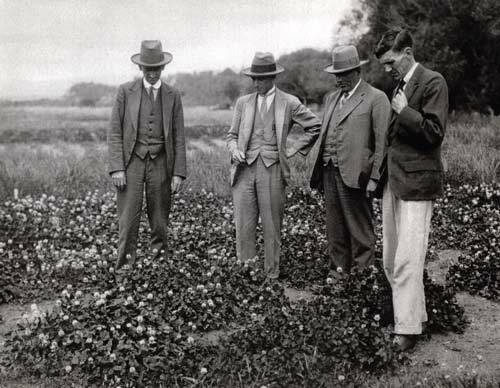 These men studying the white clover research plot at the joint Department of Agriculture and Department of Scientific and Industrial Research Plant Research Station in Palmerston North are (left to right) A. H. Cockayne (director of the research station), E. B. Levy (grassland specialist), and J. W. Dean and W. Davies (both from the Welsh Plant Breeding Station).